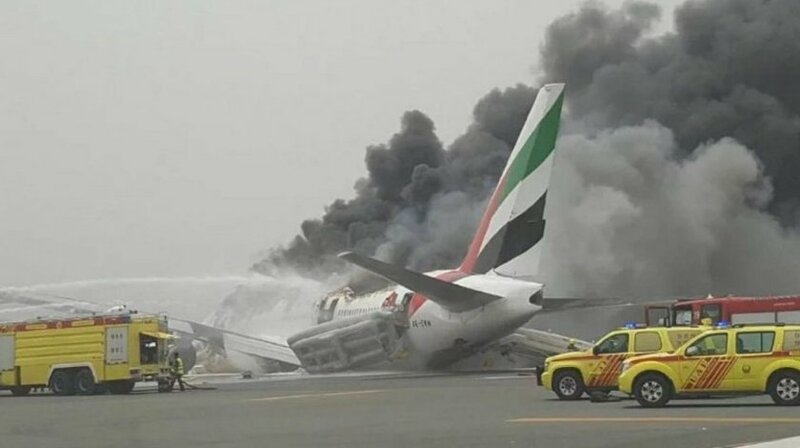 Dubai International Airport has closed until further notice after an Emirates Airline flight crash landed and burst into flames. Footage of the incident showed a tower of flames bursting from the front of the aircraft with plumes of thick smoke pouring from its upper section. Emirates EK521 had travelled from the southern Indian city of Trivandrum. All 282 passengers and 18 crew members on board the Boeing 777 have been safely evacuated. Flights destined for Dubai were being diverted to the emirate of Sharjah, Planemaker Boeing said in a statement it would be working with Emirates to get more information. Boeing is aware of the Emirates Airline Flight EK521 accident in Dubai. We are thankful all aboard were evacuated safely. A Boeing technical team is standing by to launch in support of the U.S. National Transportation Safety Board. In accordance with the international protocol governing aviation accident investigations, all inquiries about the investigation must be directed to the United Arab Emirates General Civil Aviation Authority. Regarding Emirates Airline flight EK521, under the direction of the U.S. National Transportation Safety Board, Boeing is launching a team and will serve as a technical advisor supporting the investigation led by the United Arab Emirates General Civil Aviation Authority (GCAA). In accordance with the international protocol governing aviation accident investigations, all inquiries about the investigation must be directed to the GCAA.